I'm looking for places to have CD release parties on April 18, 19, 20, 25, 26 or 27... anyone interested??? Thanks so much for reading my email news! It's really the only way I have to stay in touch with you. Write back and let me know what you're up to! THE NEW CD IS READY! UNION WOMEN!!! POLK CONFERENCE COMING! THE NEW CD IS READY!!!! I couldn't be more excited! This is my best recording ever. It's a fantastic collection of songs... 6 previously unrecorded songs of mine, 6 great songs from colleagues Kiya Heartwood, James Keelaghan, Al Grierson, John William Davis, Evan Greer and Colum Sands, and three unforgettable versions of IWW classics. I'm joined by the finest musicians in Pittsburgh, as well as Anne Weiss, the Austin Lounge Lizards, Commander Cody and Emma's Revolution. Oooh la la!! Please order your copy right away to help me dig out from the mountain of debt I incurred with this great project. If you send me the name and station address of your favorite folk radio show, I'll send them a CD with your compliments, and let you know that it's there, so that you can request your favorite songs. At this point, I think I have sent the CD to all the sponsors of the recording... If you sent me $100 and didn't get a CD yet, please accept my apologies and drop me a line to let me know. I'll get one in the mail to you immediately! And I mailed out the last of the pre-orders today... so if you don't have your CD very soon, call me or write me! His hilarious "Defenders of Marriage" is the most requested song from my last CD. The material he's traveling with now is just terrific. Email me at anne@annefeeney.com or call me at 412.877.6480 to reserve a seat and get directions. This is Roy's first Pittsburgh show and I want to give him a great welcome. I still have 15 seats left! Roy appears to be as much of a driving fool as I am. He's doing a show the NEXT night in Champaign, IL! That's a great venue and I hope all you C/U folks are taking note and clearing your calendars immediately! Roy is the best! I'm thrilled to be part of another production of Jerry Starr's brilliant play about the Sago mine disaster. My talented companera Sue Powers will be with me for this production at Indiana University of Pennsylvania -- just outside of Pittsburgh. In this moving drama, we get to watch the transformation of the miners' wives from widows to warriors as they investigate the causes of the Sago mine disaster. There are about a dozen songs featured in the show -- I wrote two of them for this play. The lineup for this festival is always awesome. They are still finalizing this year's lineup, but SONiA and Disappear Fear, Kim and Reggie Harris, Terry Allard, Tret Fure, Wishing Chair, Chris Chandler, Brian QTN, The Dreamsicles, Tom Kimmel, Joe Jencks, Stephanie Corby, Christine Havrilla and We're About 9 are all confirmed. If you are a female union member living in IL, IN, WI, MI or IA, register now for the fantastic Regina Polk Institute for union women leaders! This was the best FL tour ever! But I ended up with so many tales to tell that I've moved this section to my blog - right below this post, but you can fast-forward to it clicking here..
Julius Margolin is home from the hospital, and is doing great on his own! He and I will be gigging together on Mayday at Botto House in Haledon, NJ. Canadian labour activist Joey Hartman is recovering nicely from her "lump-out-a-me" -- a get well greeting to #2402 6888 Station Hill Dr, Burnaby, BC V3N-4X5 would be in order! My Swedish friend, Per Forsberg, just got a cool write-up about the exotic 'lawnmowers' he cares for! Don't miss this intimate opportunity to hear America's foremost political satirist - the brilliant, hilarious and outrageously talented Roy Zimmerman!! I'll do a short set, too. This show will sell out (only 30 seats total) ... so call now to reserve seats! Come see this wonderful production of Jerry Starr's powerful play. This is the cutting-edge conference for labor activists! Larry Penn, David HB Drake, Anne Feeney and more!! This was the best FL tour ever! Ken and Cee Cee, my fabulous Jacksonville hosts, now have a great radio show - Progressive Roots - Sunday nights on WZNZ radio, streaming live at http://www.1460.us from 8-10PM. Check out their myspace, and for all your performers on my list - send them your CDs!! My visit to the Miccosukee Land Coop was the best ever! Kayaking on Wicissa with Peter Broderson was fabulous - even saw a big ol' gator. The show was lots of fun too... and the next night we saw Roy Zimmerman in Tally, with a great opening set by Floridian Grant Peeples... Roy invited me up for a couple numbers, too! 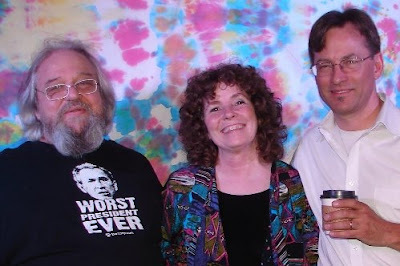 This picture is of Doug Gauss, me and Roy Zimmerman - I'm loving Doug's shirt! Then on to St Augustine where we ended up raising $1000 for the Winter Soldier Campaign at a concert I did at the UU Fellowship of St Augustine. It was such a fun show! And I stayed with American legend Stetson Kennedy and his wonderful wife Sandra Parks... I just wish our visit could have lasted longer. Here's a photo by JD Pleasant taken at the St Augustine gig. It was so wonderful to get to Orange City and reconnect with the oh-so-talented Magda Hiller and her most charming daughter Wyatt (partner Chip is no slouch either!). Then on to JAX for two busy days on campus at UNF, thanks to Andy Johnson, United Faculty, UNF and the efforts of my friend and comrade, Stan Swart. This time I met some really wonderful, engaged, concerned, bright students at UNF. It was so great to see Candice Carter again, and the Amnesty Chapter concert at the Gallery was the best show ever at UNF... Thanks to Shelley Clay-Robinson and her family, and to Roy Zimmerman for a great guest set. Stan hosts "The Brother Stan Labor Show!" LISTEN IN! -- CALL IN! Before I left Jacksonville, I got to spend most of a day with Jackie Brown's dear friend Ysryl -- he and I paid a call on Dorothy Pitman Hughes ... a feminist icon and wonderful writer who recently opened a bookstore in JAX. Dorothy managed Jackie Brown's remarkable campaign for mayor of Jacksonville (many of you will remember me raving about how amazing Jackie was in these newsletters. My friend Jackie died last year of breast cancer at the age of 46). Ysryl, on the other hand, is a living miracle, having survived catastrophic injuries to his brain when the tailgate from a dump truck almost took his head off last fall. From Jacksonville I headed to Tampa and had a great visit with Gloria Holloway and her family, and my dear friend Diane Stein. Gainesville with Jenny and Joe Courter was terrific, and the show raised a few hundred dollars to help send them to Venezuela... I'll be looking forward to their eyewitness report. Sarasota was great... catching up with Martha Shunn, the extremely dedicated and effective president of the Florida Postal Workers' Union ... and singing union songs for two hours inside Whole Foods was awesome! I wish I could get some YouTube videos of that show! WSLR community radio, 96.5 in Sarasota is a great addition to the audio landscape there... the latest project of the amazing Dave Beaton and Arlene Sweeting of Fogartyville... It was great to see the whole Fogartyville gang turn out for the show at JRs Packinghouse... Steve Stokes, Jim Glover, The Merrills and the Johnsons (Ireland bound with me, this summer! ), Aunt Marilyn, Faith Fippinger, CC Carter... so many more -- thanks! You made it into a very special night for me! From Sarasota I headed to Florida Gulf Coast University for a reunion with my old Edgewood neighbor, Vicki Dimidjian, and a chance to meet some terrific activists on this very reactionary campus... Angela and Rob - you're my heros! Then on to my Ft Myers haven with Wendyl and Bill and the gang from Manna Reading Room. And what a fun-filled St Pat's afternoon it was with the United Irish of SW Florida!!! Many thanks to Laura Griffin for lining that up! 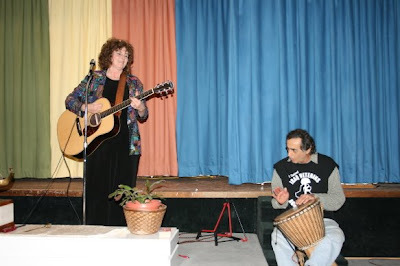 Vicki Ryder and Ray Del Papa did a fantastic job of organizing these concerts, which raised close to $2000 for the Immokalee workers' campaign for justice... check out http://ciw-online.org to learn more about their amazing work. And David Engels wrote a lovely review of the Dania Beach concert and posted it on my guestbook, http://www.annefeeney.com/guestbook.html ... a nice highlight to the Dania Beach show was Jerry Gray's banjo and singing -- part of the legendary Canadian folk group, The Travellers, Jerry regaled me with stories about introducing young Gordon Lightfoot to audiences at the Mariposa Folk Festival. I got to spend those last two days in Florida with Brooke Bell and Amy Carol Webb ... their warmth and hospitality is overwhelming... and Amy http://amycarolwebb.com played my new guitar and sang me two fabulous songs from her upcoming Florida songs CD. I took Amtrak there and back ... I'll be very happy when we have a democrat in the White House and some much needed funding is sent in Amtrak's direction. I'm hoping to be riding the train a lot in 2008... I'll keep you posted on that adventure. Anyway, there's the Sunshine State in a nutshell.... Thanks to everyone who made it so special! 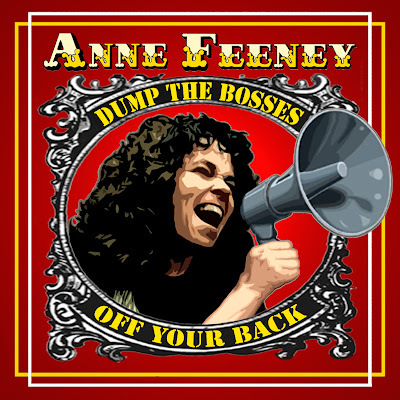 I'm always looking for work: email me at anne@annefeeney.com if you'd like to help set up a concert, or have me play at your college, conference, convention or riot. It's too late to get your name in the liner notes of the CD, but if you'd like to help me with the crushing $14,000 debt I'm carrying from this project, I'd sure appreciate it. will be most welcome and deeply appreciated. You can send me a donation via paypal too... there's a "Donation" button just underneath my picture on the right hand side of this page. And many many thanks to the folks who stepped up to help me with this. Doing a recording is a real leap of faith on a budget like mine, but when you get to hear it, you'll think it was worth it, I'm sure. Commander Cody came in to play piano and sing on "Preacher and the Slave." The Austin Lounge Lizards harmonized my a capella gospel tune "You Will Answer," and Pat and Sandy (Emma's Revolution) harmonize on "Hillcrest Mine." And when you hear the lush magnificent harmonies that Anne Weiss arranged for "How Long?" you'll be dazzled! I'd love to do a CD release concert in your hometown too - so let me know if you have any ideas. Also.. if you have a great folk show on the radio, let me know about it. I'm happy to send CDs to your favorite folk show... and I'll tell them you sent me! If you write reviews of folk music for any publication, let me know and I'll send you a review copy! I had to buy a new guitar. I'll be taking my new Larrivee with me to Cleveland and Florida. It's a beautiful guitar, and I'm sure I'll learn to love it. (Guitar prices seem to have kept pace with CEO compensation in the last 40 years, but my friends at Swissvale Music have made me a generous deal.) Still, incurring such a major expense in the middle of doing a CD was DEFINITELY NOT in my plans. I'm looking forward to this new era, though. Be sure to come up and check her out at my upcoming gigs! A new production of BURIED: The Story of the Sago Mine Disaster opens at Indiana University of Pennsylvania (just about 40 minutes from downtown Pittsburgh) on April 3 and runs through April 6th. Jerry Starr's powerful play about the transformation of the Sago women from widows to warriors is riveting, and it's my pleasure and honor to provide the music throughout this production, along with my talented friend Sue Powers on banjo. My research on my Grandfather's life and work is on hiatus until I return from Florida... but there is so much source material out there, I feel like I'm really getting to know him, even though he died more than 12 years before I was born. I'm so grateful to the IUP Labor Center for giving me this opportunity to dig into this most personally interesting chapter of PA labor history. Our entree was a stretch, but really... when this dish was invented for the King of Sweden in 1897 the average life expectancy was 45 years -- It was NO COUNTRY FOR OLD MEN ... We served a variation of the Swedish classic, Veal Oscar, substituting free range hormone/anti-biotic free pork filets for the veal ..
and our dessert of ATONEMENT was Burnt Almond Torte, provided by Mary Magan. Julius Margolin (http://georgeandjulius.com) is doing much better. Thanks to all of you who sent cards. He'd still enjoy hearing from you, I'm sure, if you haven't gotten around to sending him a card yet.. I'm looking forward to performing with him at Botto House on Mayday. I'm going to be arranging a benefit concert for him here in Pittsburgh, and performing at one in Madison, WI in May. My daughter Amy is now officially a certified massage therapist. She has completed her coursework and passed the state exam in Texas. Congratulations! Joseph and Manelle McCahill welcomed Baby Benjamin on Feb 21st... healthy and beautiful! Mary and Tom Weldon visited Aunt Claire in Aiken, SC a couple weeks ago. Claire was overjoyed! The Church is located between Euclid Heights Blvd. and Coventry Rd. Lancashire is a one-way street that is entered from Euclid Hts. Blvd. The Society is a 2 storied brick building on the right hand side, across from Musicians Towers. Parking is available on either side of the building, on the street, or in metered public parking lots nearby. This is one of my favorite gigs ... I look forward to it all year long. Tickets: $10 advance and at the door. For more info, visit wakullareporter.com or write to zimconcert@gmail.com. Iraq Veterans against the War will be tabling at the concert, and we will be accepting your generous checks and contributions for their work at the show. 904-471-2047 is the number of the church. Anne Feeney in Concert with special guest Magda Hiller!! Stan Swart, "Brother Stan the Union Man," is my host and contact for this residency. "Brother Stan the Union Man," Stan Swart, is my host and your contact for this residency. Come, and learn more about the important work of Amnesty International! Come at 7:30... we'll start promptly at 8. Reserve a space now... email Gloria at gshello@tampaybay.rr.com or call 813-837-6572 - House concerts are a fabulous way to hear music! Don't be shy, call Gloria now! Free/no-permit-needed guest parking is plentiful on Sunday evenings either in the Student Union bldg parking lot or directly across the street in guest lot. St Patrick's Day Feast !!! This will be so much fun!! In addition to my usual hell-raising repertoire, this show only will include a huge selection of Irish favorites - ballads, drinking songs, sing-alongs, sea chanteys and more!! Don't miss it. This is a fundraising concert to benefit the work of the Coalition of Immokalee Workers. This powerful play by Jerry Starr, documents the transformation of the miners' wives from widows to warriors, and features lots of wonderful music. Detroit CD Release of "Dump the Bosses Off Your Back"